Prisoners is the sort of commercial fare that holds up its end of the bargain in the endeavour to thrill, terrify, and entertain - a draining, grim, and at times, vicious drama. Taking place in the colourless pine barrens of a Northeastern winter, the story centres around the kidnapping of two young girls on Thanksgiving Day, just outside their suburban homes. A mysterious RV has been seen parked nearby, and Jake Gyllenhaal, as black-clad young Detective Loki, is set on the case to arrest soft-spoken local oddball Alex, played by Paul Dano. Keller Dover (Hugh Jackman) is the father of one of the girls, a local survivalist-type who is enraged when Dano is released without charge. As the clock ticks away and Dover grows frantic, he decides to imprison Alex himself and take matters into his own hands to find out where his daughter is. Sparse and unadorned, with the aid of DP Roger Deakins' subtle, washed-out colour palette, the soundtrack is accompanied by little non-diegetic music, except for the occasional stir of faint strings. A bubbling tension builds as Loki - a prototypical noir cop everyman and a total cipher, emptied of any backstory - hunts for the kidnapper. In the meantime, Jackman's Dover grows increasingly unstable as he clings to the illusion of control, and the families are put through ongoing trauma as the days stretch on with little hope. Loki's (at times uncanny) intuitive police work wins the day as Dover's brash behaviour becomes unhinged and detrimental. Utterly successful in its first act at twisting the guts of its viewers, it later falls into an over-reaching whodunit of sorts, knocking our willing suspension of disbelief one too many times not to interfere with the believability and cohesion of the story. 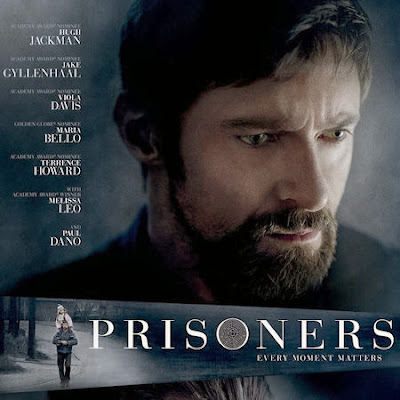 Prisoners is one of those films that is so taken with providing suspense that it never truly addresses the moral dilemma that it plays its action against; revenge and torture as plot device, essentially. The film uses -- exploits, perhaps -- the backdrop of topical American issues, fiddling with its underlying social and political undercurrents, without any desire to interrogate or pass comment on them. Dover's torture of the suspect is never condoned, and a small moment between Loki and Mrs. Dover in a hospital hints at the detective's unspoken feelings where the distraught father is concerned. But in a plot that moves at too breakneck of a speed to consider anything too deeply, one should not expect any very serious contemplation. Nonetheless, it's a story that is finely performed by its actors, and it sustains its 153-minute running time with a tightly-wound rhythm and faintly oppressive air. Unfortunately, the introduction of so many red herrings and plot twists late in the film leads to a convoluted, beleaguered third act. It feels like a shame for it to dig its claws in so deeply, only to retract them in the last 40 minutes of the film. Ultimately flawed but still a solidly gripping story, Prisoners' tension and miserablism is finely-tuned enough to make it salvageable from its shabby plotting.